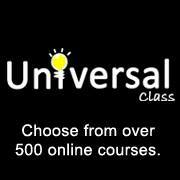 Universal Class for libraries is an online educational service providing a diverse offering of learning courses for people interested in the lifelong pursuit of knowledge. There are over 500 courses that you can take at any time without waiting for sessions to start or end. Once in a course, you will watch engaging videos and receive feedback from friendly instructors. When you complete a course, Universal Class offers Continuing Education Unit (CEU) certificates to document your achievement. It is free to patrons of Timberland Regional Library (a library card is required). You can attend classes and complete assignments on your own schedule. Each course has a real instructor you can communicate with via e-mail. You can access courses at any time over the Internet. These are non-college-credit courses provided for your personal enrichment. Many courses offer Continuing Education Units (CEUs) upon completion.